The world of Internet is full of memes. Memes rule. Memes are a way of expressing love and hate for anything and everything. And, with the soccer fans being divided largely into team Ronaldo and Team Messi, there are million of memes churned out by one supporter or the other to troll the idol of the opposite camp. Recently, a meme appeared on the net trolling Messi. 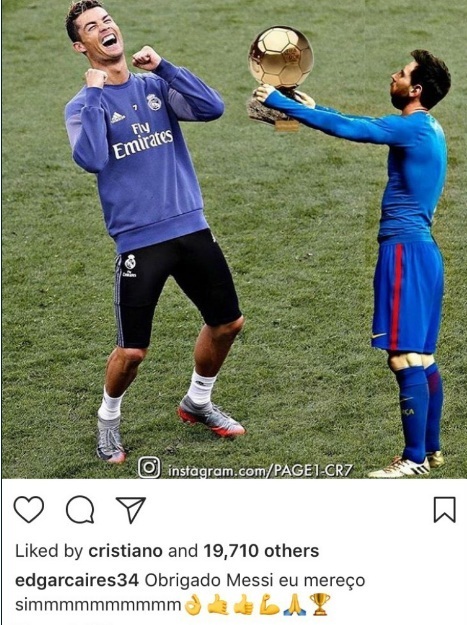 And, Ronaldo seems to ‘like’ it – literally so, because he actually ‘Liked’ a meme on Instagram! The former Manchester United forward, who won the Ballon d’Or for his performance in the last season, is among the top favourites for winning the award again for this season, especially after two consecutive trophy wins by his team. 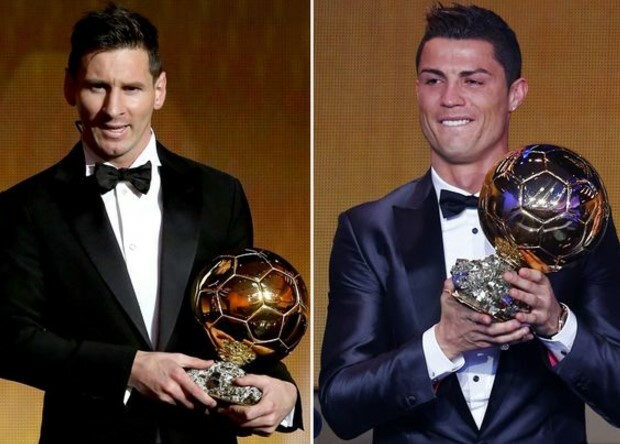 And if he does win it, he will level with his arch rival Messi’s record of five Ballon d’Ors. He scored twice to seal Champions League victory for Real Madrid. The Portugal player donned a new look at Madrid’s celebrations on Sunday in the Spanish capital, and even participated in the Blancos supporters chants that he ought to win the Ballon d’Or. It seems that the Real Madrid superstar is confident about his chances of equalling Lionel Messi’s record of five Ballon d’Ors come the end of the year, if his online networking movement is anything to go by. One Ronaldo fan set up a photoshopped picture of Messi giving his talented competitor the most celebrated individual prize in the soccer world, and it has not gone unnoticed by Ronaldo himself. 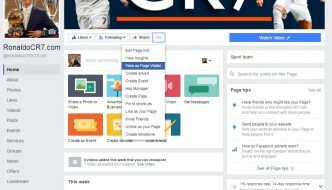 And, the eagle-eyed internet users soon realized that Ronaldo had “Liked” the picture! There has been no response from Messi up until now. While we will have to wait till December to see if the meme has made the right prediction, we can only hope that Ronaldo’s online activity will not be misconstrued. The player can most likely be pardoned for having a a little bit of fun.